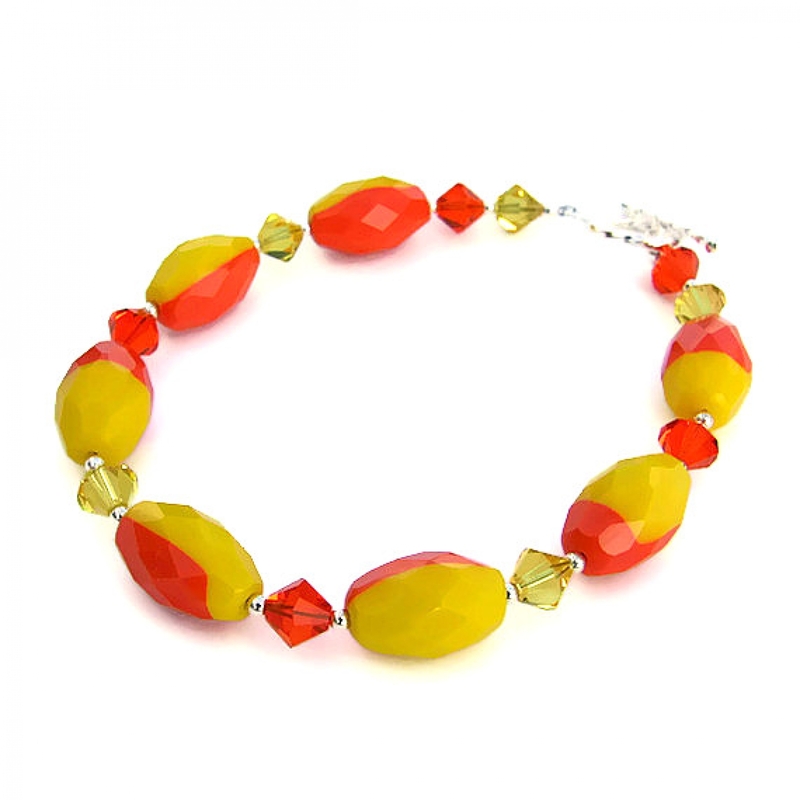 If you are looking for a fun bracelet that captures the sun drenched essence of summer, then the sparkly CITRUS TANGO bracelet is for you. 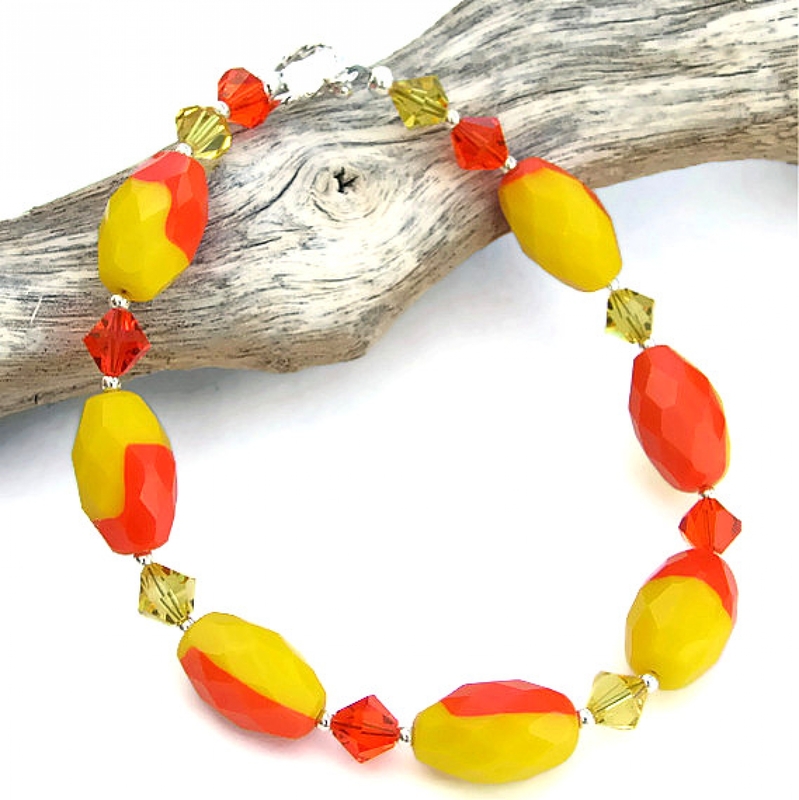 This handmade beauty was created with bicolor lemon yellow and tangerine orange vintage Czech glass ovals, glittering Swarovski crystals in two colors and sterling silver. 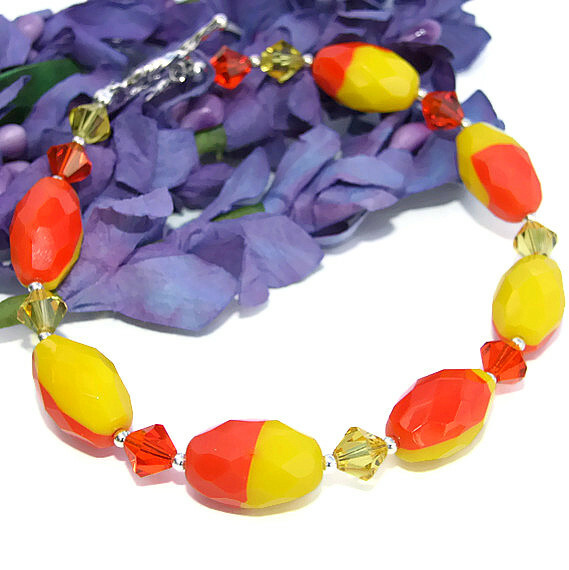 Carefully designed and handmade by Catherine of Shadow Dog Designs, the CITRUS TANGO bracelet will look glorious around your wrist and will take you beautifully through the lively days of summer (or when you need a winter pick-me-up), leaving sparks of bright citrus color wherever you go! *Please note: I will gladly re-size the CITRUS TANGO bracelet at no extra charge. Just email me with the specifications. 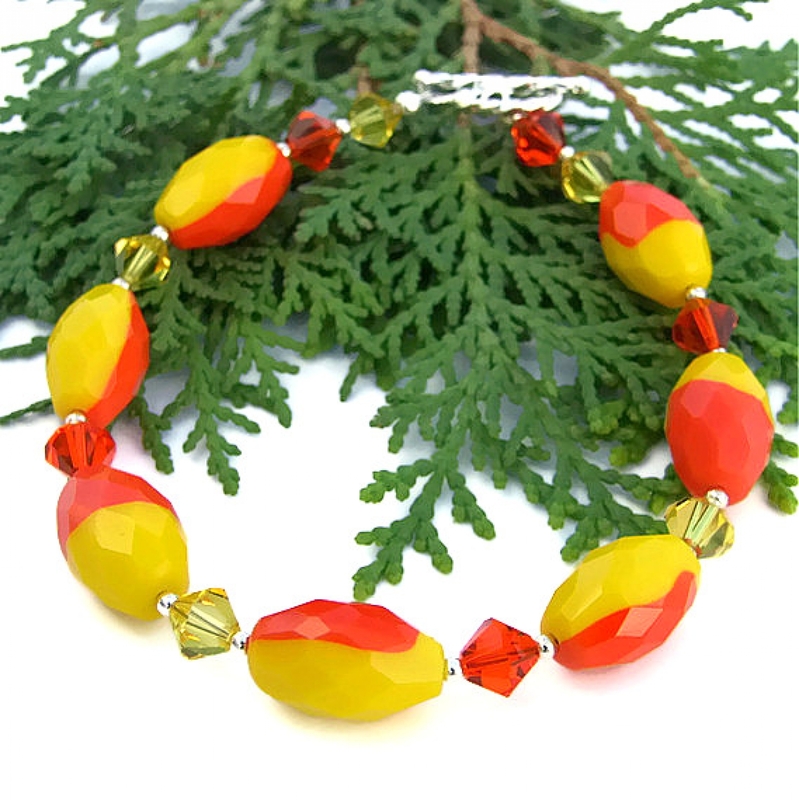 The star attraction for the CITRUS TANGO bracelet is the stunning vintage Czech glass ovals in a cheery bi-color of lemon yellow and tangerine orange. Czech glass has been made for hundreds of years in what is now the Czech Republic and is renowned for its beautiful colors, designs and finishes. The beads were made in the 1940's-1950's - a huge amount of vintage sparkle, indeed! If you take a close look at the beads in the photos, you will see no two beads are exactly alike, that each has its own unique personality. When the bracelet is worn, there is a kinetic effect as the beads roll, creating a different look at almost every movement. To add even more drama, the beads are faceted which adds sparkly goodness to the total look! Sterling silver 2mm beads were used to act as frames to each of the Czech glass beads and to separate them from the Swarovski crystals. 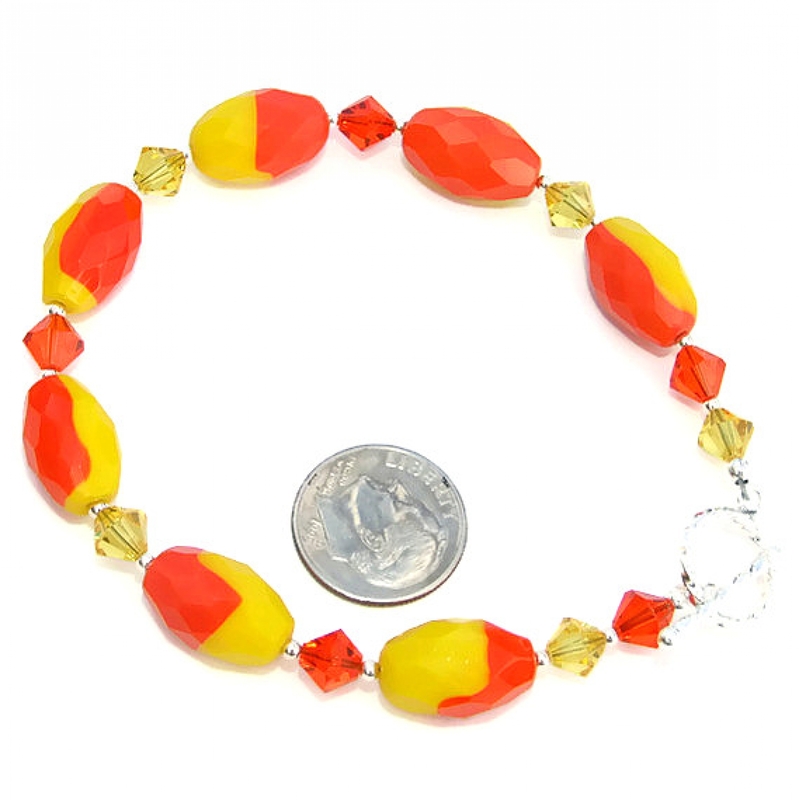 To keep the orange and yellow citrus theme, two colors of Swarovski crystals were used in the bracelet. The crystals are faceted 6mm bicones - and, boy, do they ever sparkle! 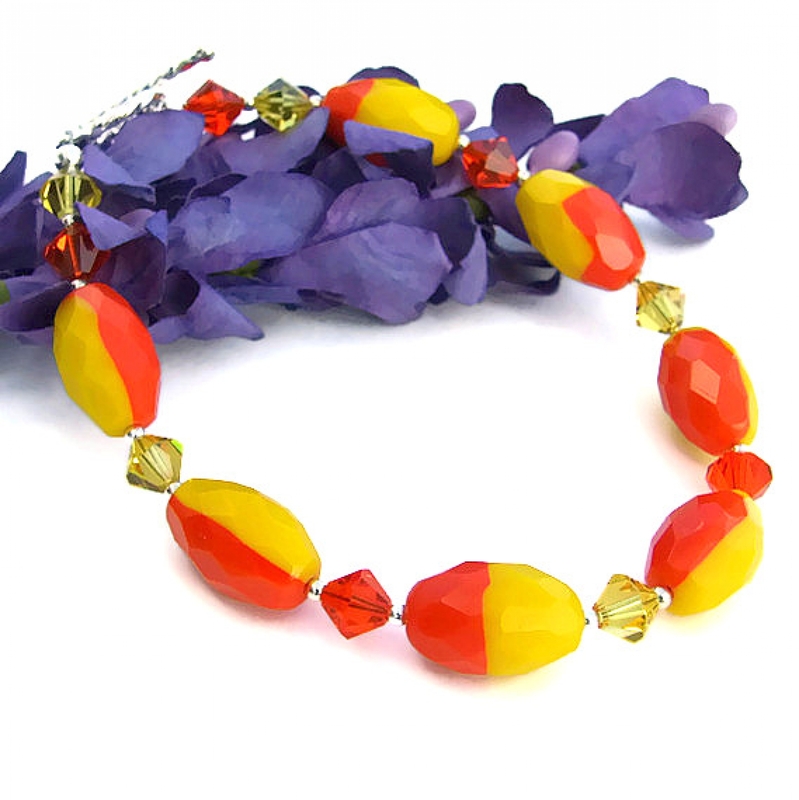 The orange color is called "hyacinth" and the yellow crystals are "light topaz". Alternating colors are used between each Czech glass ovals, ending with two crystals on each side of the clasp. More glittery goodness! To finish the bracelet, a sterling silver toggle clasp wit a beautiful twisted design was used. Because of its texture, the clasp also catches and reflects the light - a gorgeous finish to the CITRUS TANGO bracelet. Even though man-made, glass and crystals carry the energies of transformation, rebirth and communication. Silver is the metal of love and healing. The CITRUS TANGO bracelet will come with two informational drop tags: one with the piece's name; the other lists the materials used in the bracelet and the "language" of the stones and metals.